Product Bar Code: 77544825000 Case Dimensions Height (cm): 25 Length (cm): 38 Units in Case: 24 Width (cm): 18 Kosher Kosher: PARVE Passover: CHAMETZ Supervision: BADATZ, O.U Technical Data Gross Weight: 82.5 G Net Weight: 70 G Background: Bissli is Osem’s number 2 snack brand (not far behind Bamba) and belongs to the wheat snack category. The two leading Bissli flavors are Grill and Barbeque, and comprise most of the Bissli sales. What is Bissli? Shapes and flavors–Basli is available in a variety of shapes and flavors. · A multi-sensory experience–Bissli stimulates your taste buds in every way with its crunchy texture and dominant flavor. · Compelling–once you start eating Bissli, you can’t stop. 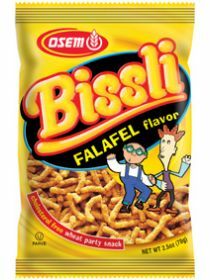 · Israeli–Bissli is as Israeli as it can be. It’s popular with everyone, straightforward and unpretentious. Target Audience: Teenagers, especially the media buffs who are constantly seeking real time change and up-dates. Main areas of interest–everything media-related from music and sports to fashion and computers. Identity Slogan: Load me up with Bissli. Brand Characters: The Grill and Barbeque characters are closely identified with the brand. Grill has Bissli Grill-shaped hair, is laid-back, witty and sharp-tongued. Barbeque who has curly, Bissli Barbeque-shaped hair is depressive and apprehensive. Barbeque is always anxious and Grill is cool and easygoing. Barbeque is always worried that he’ll run out of Bissli and Grill calms him down. These two characters have already appeared in media clips as well as in the teenage press, Internet, etc.